Queries are like mining for gold, because everyone is searching for the motherload of data that is hidden within Dynamics AX, and once they find it, they mine it until it dries out and they have to start prospecting again. Also, the secret maps to that data are hidden away, usually on someone’s own personal hard drive, and are rarely shared with other prospectors. Office 365 and Power Query changes that because it allows you to share any of your queries with everyone within the organization, allowing everyone including the non-technical users that would never create a query. No more claim jumping, there is enough data out there for everyone to mine. 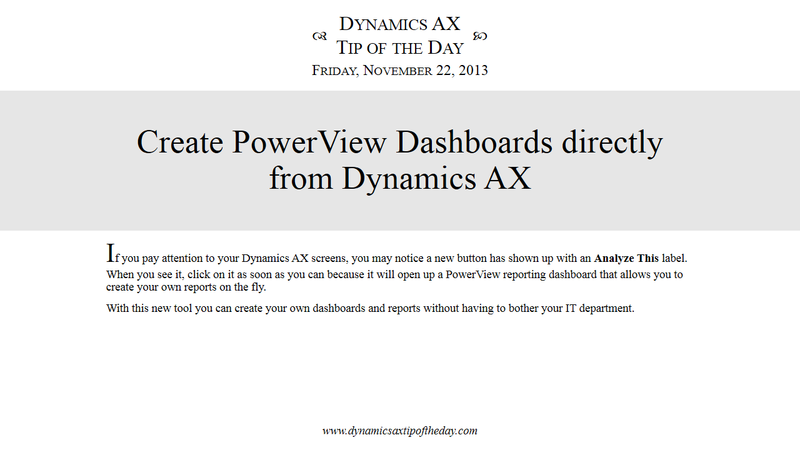 PowerView is a great way to create your own dashboards and analysis for Dynamics AX because everyone is able to use it… even the non-technical of you out there. 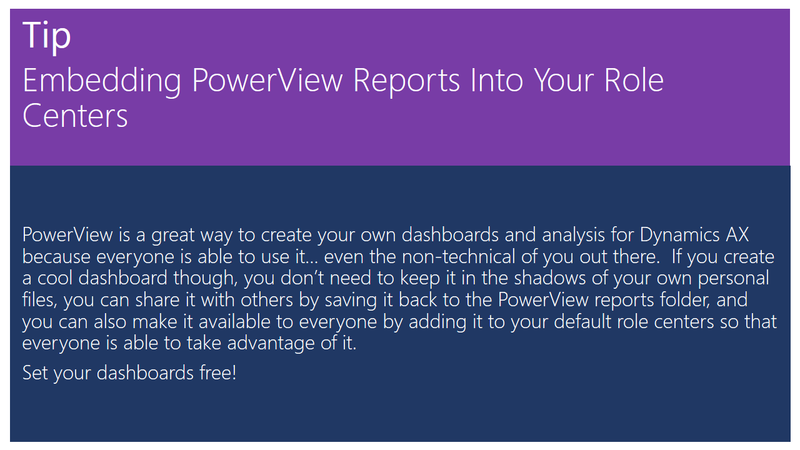 If you create a cool dashboard though, you don’t need to keep it in the shadows of your own personal files, you can share it with others by saving it back to the PowerView reports folder, and you can also make it available to everyone by adding it to your default role centers so that everyone is able to take advantage of it. Excel is probably the number one reporting tool because it is on everyone’s computer, and also because it is so easy to manipulate the data and create your own analysis, charts and tables. In the past though, the more technical users have had a slight advantage over the general users because they knew the secret table combinations that allowed them to piece data together directly from the database, giving them better insight and reports, whilst the less technical users had to resort to cutting and pasting data, or transcribing pieces of information from other reports into Excel which made their reports tedious to build and also prone to errors. 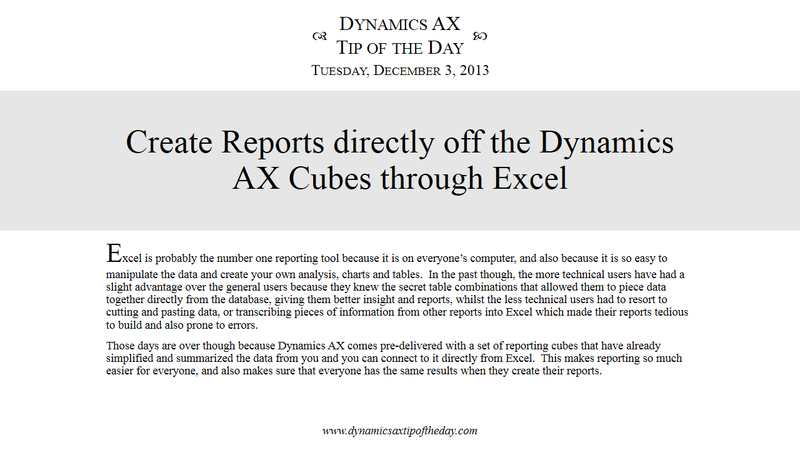 Those days are over though because Dynamics AX comes pre-delivered with a set of reporting cubes that have already simplified and summarized the data from you and you can connect to it directly from Excel. This makes reporting so much easier for everyone, and also makes sure that everyone has the same results when they create their reports. 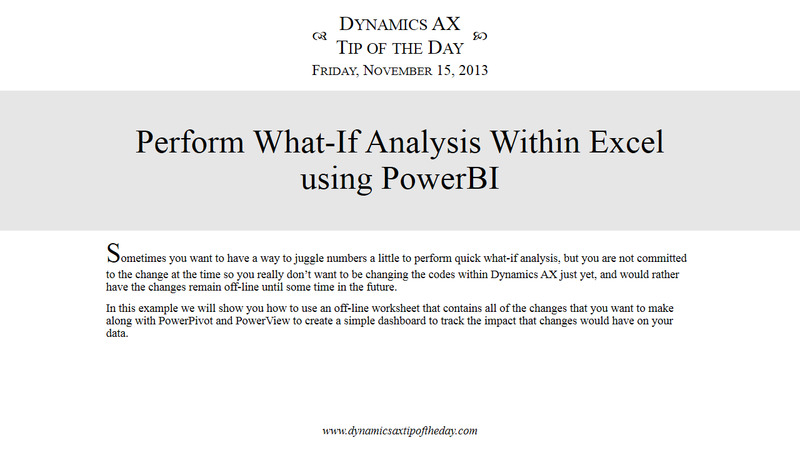 If you pay attention to your Dynamics AX screens, you may notice a new button has shown up with an Analyze This label. When you see it, click on it as soon as you can because it will open up a PowerView reporting dashboard that allows you to create your own reports on the fly. With this new tool you can create your own dashboards and reports without having to bother your IT department. 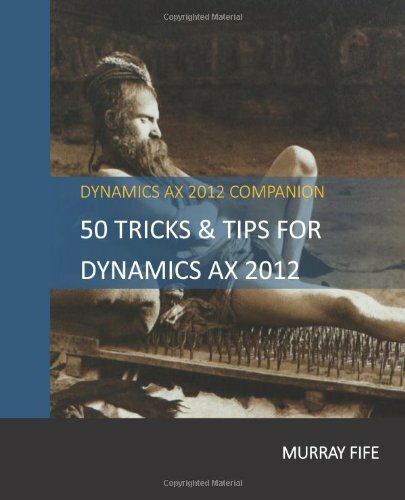 Sometimes you want to have a way to juggle numbers a little to perform quick what-if analysis, but you are not committed to the change at the time so you really don’t want to be changing the codes within Dynamics AX just yet, and would rather have the changes remain off-line until some time in the future. In this example we will show you how to use an off-line worksheet that contains all of the changes that you want to make along with PowerPivot and PowerView to create a simple dashboard to track the impact that changes would have on your data.